There’s a joke on the interwebs that goes like this: George R.R. Martin, Joss Whedon, and Stephen Moffat walk into a bar. Every character you ever loved dies. After reading A Storm of Swords, I can confirm this to be true; however, some characters that you absolutely despise also die. It’s a storm of double-edged swords, one might say. Ha. Ha. I can honestly say that I found this book to be the most exciting and interesting one so far simply because of the body count. It sounds morbid, but so many characters are dead, which really adds excitement and tragedy and satisfaction (in some cases) to the book. I seriously couldn’t put this book down…figuratively speaking. I say figuratively because I didn’t read a physical copy of this book; rather, Roy Dotrice read it to me. I got into audiobooks about a year ago after lamenting that I never feel like sitting down to read a for-fun book because I do so much reading for school. My solution was to start downloading audiobooks and listen to them whenever I got the chance: on the bus, while walking to class, while painting my nails, on the way to get groceries, anywhere. The result has been highly entertaining. I’ve found myself with my mouth open in shock at the grocery store, crying on the bus, laughing to myself while trying to push through a crowd on the way to class. I’m sure people think I’m crazy, but this system works for me and I’ve probably consumed 5+ books this way, so I don’t care. That being said, thar be spoilers ahead. 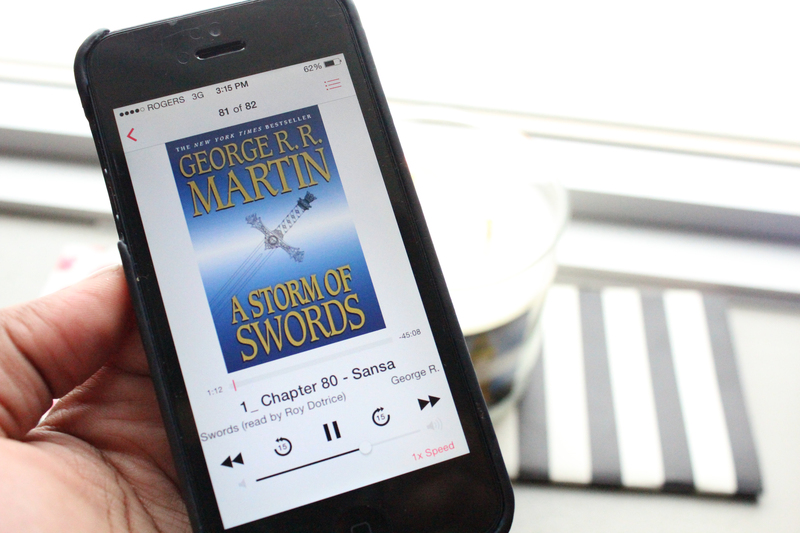 If you haven’t read A Storm of Swords or you’re currently watching the Game of Thrones TV series, you’re going to not want to read on. If you’ve read it or don’t intend to, read on!